It's really sad that they never have taken the engineering part serious, "just let's us make some fine sales posters nobody will read them" is a safe way to keep engineers away. Yes the C program better make the correct code! But it just bloat the code size. tiny817 is a recent addition to IAR EWAVR; IIRC, IAR is the first AVR partner. tiny417, tiny 814, and tiny816 aren't yet in IAR EWAVR. The Kickstart license is zero price for up to 4KB of code space. Is this the first AVR with a trace capability? Is the [periodic, or on-demand, probably] "readout" equivalent to "trace"? I'd say not. Now MTB in Cortex M - that's another thing - that is a feature really worth having! EDIT: forgot to say that there is a "cost" involved. You have to set aside something like 1K of RAM in the chip to act as the MTB. As the CPU executes it cyclically logs where it's been in that buffer. At the next breakpoint it uses the data to show the last N instructions executed. Heh, I just arrived at the same conclusion. But how should I do it? 1: Let AS7 upgrade my existing AS6.2 (assuming that it even attempts to do that). Does that work, or am I asking for trouble? 2: Install AS7 in a new dir and keep my AS6.2. Is it possible? How about USB drivers for programmers/debuggers? Can I seamlessly use one or the other whenever I please? 3: Uninstall AS6.2 and then do a clean install of AS7. Hopefully I can still build old projects in AS7 if the need should arise. I had a 6.2 and just installed 7 without dealing with 6.2. and that seems to work (I just checked that 6.2 still run , (but I only think that I have ASM peojects)). Mouser Electronics has placed orders. The correct name should have been xtiny. It's a xmega without at lot of things! Agreed, technically and to avoid user confusion, that would have made solid sense. This means that it (flash) shares the same address space and instructions as SRAM, EEPROM, and I/O registers. This data space is accessible through the use of LD/ST instructions in assembly. Previously, on some of the older Tiny devices flash has been accessible only through the LPM and SPM instructions. In the new tinyAVR devices the LPM instruction still exists, but not the SPM instruction. If existing assembly code that writes to flash is to be ported from older to new tinyAVR devices, the SPM instructions have to be replaced by ST instructions. CodeVisionAVR plans to support the new parts. To avoid the bleeding edge edge of technology and support, my plan is to wait for CVAVR, the easy way. Never before has it been so easy to hand solder surface mount components. "Schmartboard|ez" makes it easy to solder SOIC, QFP, QFN and other component packages with pitches as small as .4mm. When you can buy an ATTINY817-XMINI for £6.95 why wouldn't you just buy one of those if you don't fancy soldering? They even throw in a debugger/programmer for free! The QFN-to-DIP adapter is for breadboards and protoboards. The tiny817 XMini is Arduino shield capable with some relatively simple soldering; there are Arduino shields as protoboards. Yeah, for that price it's better to just buy the XMINI board. I haven't heard of anyone else yet, so I guess I am the first to receive one. Granted, Denmark is quite close to Norway, compared to most other participants here. A big thank you for this initiative. Mouser has it as EOL whereas Digi-Key has not indicated that. 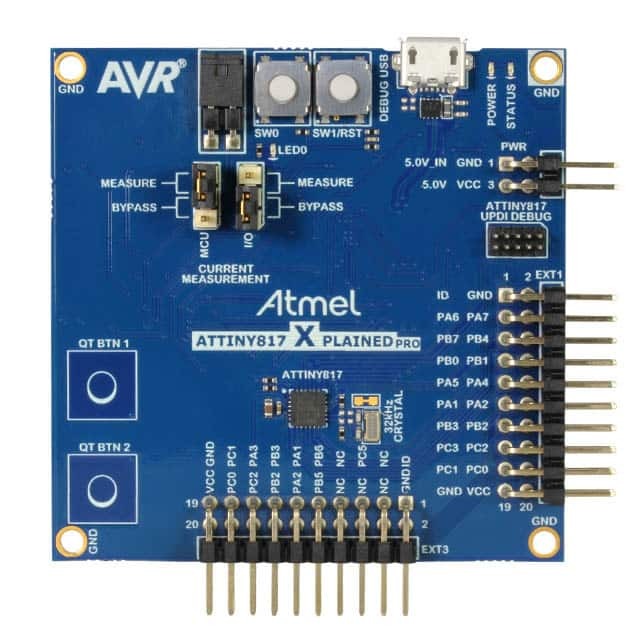 It looks like the 10pin 50mil header is the new programmer/debugger interface connector that directly interfaces with the Atmel ICE and Jtag Mk3. Interesting... I also see Mouser shows 47 as on order ?! Has anyone seen/tried a Pro ? - Any performance comparisons with Mini, on the 817 ? or, have other PRO's been EOL'd too, in a more general prune exercise ? Yay! Finally this is out and public knowledge. After months and months of development. Whew. This is first in the new breed of Tiny AVRs. watch out for more. in a more general prune exercise ? I don't know how to deal with it but something needs to be done. the code don't compile/run on the 817 mostly because the IO structure are very different, can't point to registers etc. and instructions timing are different etc (program interface are also different). If there needs to be a xtiny (what really should have been the name) forum or some sticky notes or ... is not my call. But some TUT's needs to be made fast! I find the datasheet a bit hard to follow. And it doesn't really "feel" like an Xmega datasheet either. "Table 12-1. SLEEPCTRL Product Dependencies" says Interrupts are not applicable, yet wakeup relies on an enabled interrupt source as in AVR8. Right? Power-down wakeup sources include INTn and pin-change. Yet right above the chart the text only mentions pin-change. The other power-down wakeup source is TWI address match. No USART start-frame detection? Sounds like a step back. Now, on to watchdog. It runs during power-down sleep according to the chart. But not listed as a wakeup source? Is the watchdog much different than AVR8, where recent models have watchdog-interrupt capability? Indeed, no watchdog interrupt. Only action is reset. So what use would enabled watchdog be in power-down? I just received my tiny817 xplained and it looks NOTHING like the one in the pictures above. I guess There are two versions of the xplained, a pro version and the one I have. Yes; wake on UART SOF is from standby. There's not much difference in current between power-down and standby and it's 10micro-sec (typ) to wake from either power-down or standby. Looks nothing like the other one...the "PRO" version. So I guess there are two kits. One has the crystal, the other does not. XPRO has a UC3A4 for EDBG and a SAMD20 for current measurement. Is that correct - A serial port is quite important for debug ? Virtual COM is mentioned with the Embedded Debugger. In expectation of the board's arrival I have updated AS7 on my main computer, I know,I know I'll be sorry. Started an ASM project and added ye olde STK500 leds file and of course it doesn't assemble, I will try porting the same project from the Xmega version and I think I will have better results. So forget AVRtiny when working with T817 and relatives and think Xmega. HA! Success, not as bad as I thought. Using the macros helps with the locations of the I/O registers, just one change necessary to set portb to output. ;**** Now wait a while to make LED changes visible. Actually there is a bug and PORTA needs pull up resistors on the switches to work. I was looking at how to do it in software but it seems convoluted, not impossible though. Sounds like a microchip experience. :) Life was simpler, when that could be avoided. VPORTs will be next, however I don't see how to set the pull ups in a group like the standard Mega/Tiny or Xmega with the group control, don't really want to do that 1 pin at a time. I can see that the lack of a pull up group is a pain at init, but is there normally not in a hurry, so make a loop if they all need pull up's, (and yes it would have been nice if it could have been done like on a tiny). Do you really under program run have to change pull's up on hole groups? Yep, all of PORTA (or at least 7 bits) need pull ups for the switches. Of course once I get my board I can connect it to the real STK500 as it has already hardware pull ups on the switches. but I mean do you really need to switch the pull up on and off all the time on those 7 IO's ? I have never had to do that on more than 1 IO at the time. No, ON ONLY as part of the init. What makes you think I want to turn them off? Yes I can do that 1 pin at a time but all other chips allow multiple pins to be pulled up (or down for Xmegas) in just one instruction so why not the T817 family? Therefore my new thread on the subject for the Atmel people in the know. Is it by design or a boo boo?